Brother Jesse Blog: This Week in The Final Call Newspaper: "We Must Act Now!" 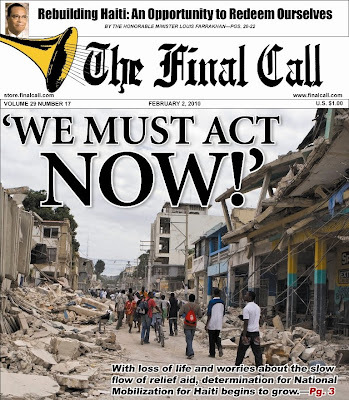 This Week in The Final Call Newspaper: "We Must Act Now!" Whether you pick up a copy from the brother on the corner in your city or read it online, do not let a week go by without getting a copy. You will miss valuable information and guidance. In this week's edition, the rebuilding of Haiti is once again the focal point. The Final Call staff delivers more extensive coverage and insight into upcoming national mobilization efforts to be led by the Honorable Minister Louis Farrakhan. CHICAGO (FinalCall.com) - With Haiti struggling, trying to stand but still suffering badly after a major earthquake, a call for a National Mobilization on behalf of the first Black Republic in the western hemisphere found fertile ground in the hearts of professionals, organizational leaders and activists during a recent meeting. Called by the Honorable Minister Louis Farrakhan of the Nation of Islam, and facilitated by Leonard F. Muhammad, Claudette Marie Muhammad and Dr. Conrad Worrill, participants in the quickly called gathering Jan. 20 at the South Shore Cultural Center offered a resounding vote of confidence for a joint effort, led by the Haitian community, to rebuild the country. The clear consensus was Blacks and Haitians could not wait for others to save the suffering country, but had to organize and plan for the long-term work of rebuilding and reconstruction. Haiti - Profiting from misery?